The hire fleet cordless battery cable crimpers allow for the fast accurate crimping of cables upto 630mm2. The cordless cable crimper has a simple one button operation for controlling all the tools functions and has a balanced centre of gravity ensure it is an effortless tool to use. 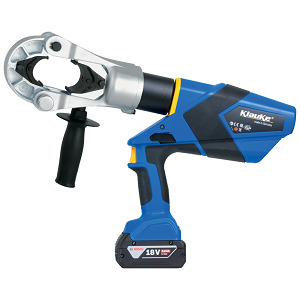 Hiring the cordless cable crimper allows for fast and powerful crimping via its two stage hydraulic system allowing for fast action and then power when needed. The cordless cable crimper has an automatic return when crimping is complete and also an auto retract stop function when doing multiple crimps. With the rotating head and the integral LED worklight, the battery cable crimper makes crimping cables a simple task.